Kenneth “Pounce” Pouncey born and raised in Cincinnati, Ohio started out in 6th grade desiring to play the drums, however he was selected to play the trumpet. 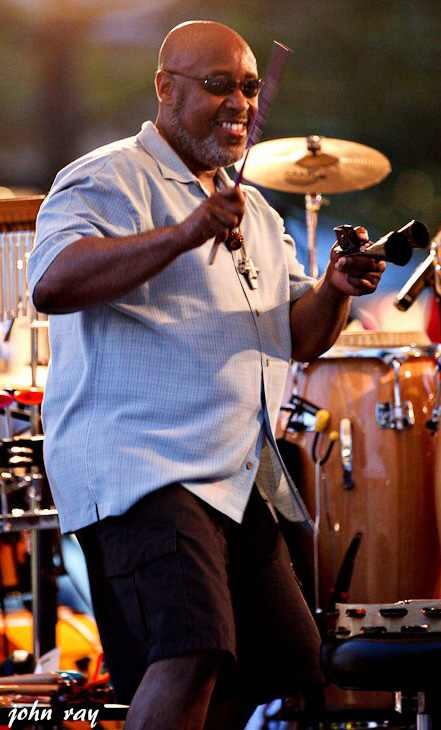 He played trumpet with the Reggie Calloway formerly of Midnight Star. After many months of following bands and supporting friends and family in their bands Pounce became inspired to go after his dream of playing the drums; In 2007 Pounce purchased a set of Congas (Gon Bops), that he used to sit in with local bands out of Cincinnati and Dayton. He served as the percussionist for a band ( Groove Crew) out of Dayton for 1 year where he received some good experiences. Pounce relocated to Columbus and began attending jam sessions which lead him to sit in with various bands. For the last two years Pounce has devoted his time between two bands; fo/mo/deep of Columbus, Oh and The Special Band of Cincinnati Ohio. Pounce has had the honor of sharing the stage with Roy Ayers and opened up for Mint Condition.These experiences has been motivating, stimulating and has made him continue to strive to be the best percussionist he can be.